Technical Car Experts Answers everything you need: 2001 Escape rear passenger door will not open? 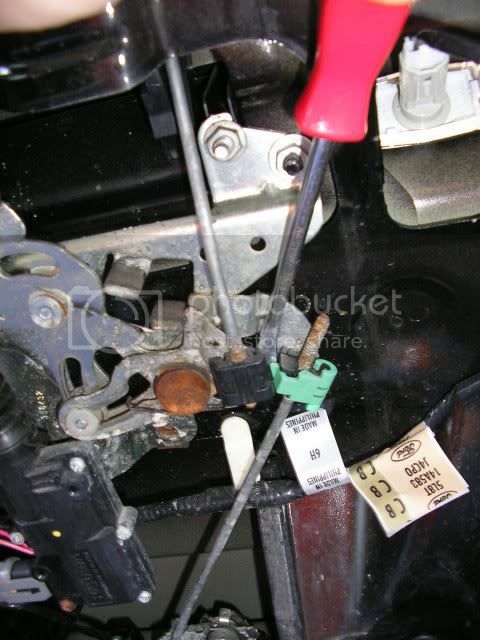 2001 Escape rear passenger door will not open? Same problem with my 2001 Escape rear passenger door. The lock mechanism seized in the locked position and I couldn't get it opened from inside or out. I could hear the lock trying to unlock when using the key fob, but the latch would not release. The problem was with the cable from the interior door handle. When the handle was pulled, the cable wouldn't release the lock mechanism. It is possible to remove the door interior panel with the door closed. You need to remove the 2 screws in the door handles and then you need a thin hook of some sort to get under the bottom of the panel (there is a groove at the bottom that provides a gap). I used a tool for installing laminate flooring and it worked like a charm. The only thing holding the panel ar a series plastic plugs around sides and bottom. Once the interior panel is off there is very little of the latch mechanism visible due to the door design. You will be able to see the wiring harness that activates the lock. With a mirror and light you should be able to see the inner side of the latch mechanism close to where the wire harness attaches. You'll need to concentrate on the side closest to you (against the inside of the door frame, not the outer door skin). You will see the end of the locking latch. It's a steel piece about an 1/8" thick and about a 1/2" high. This latch shifts up and down and needs to be shifted to the top position to release the lock. this part is tricky due to the fact that it's hard to see and you need a thin tool to move the latch. I ended up cutting the door frame back a bit with a mini grinder cutting wheel to get better access but I'd suggest this only as a last resort (the interior door panel hides the cuts I made) Once I had the door open I took apart the whole mechanism and sprayed it down with Rust Check lubricant. It now works like a charm. 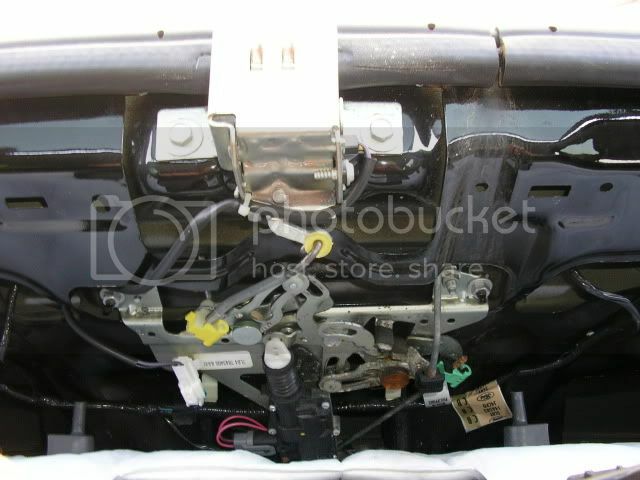 back door & glass wont open on 2001 ford escape.Its all automatic and there is no key hole, how can i now open the back door and window. does anyone know if there is a safety latch? or possible child lock? no saftey latch . 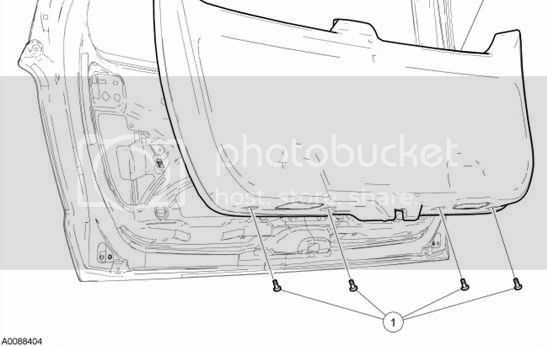 one is that the actuator is not unlocking the liftgate. when this happend the glass and liftgate wont release. 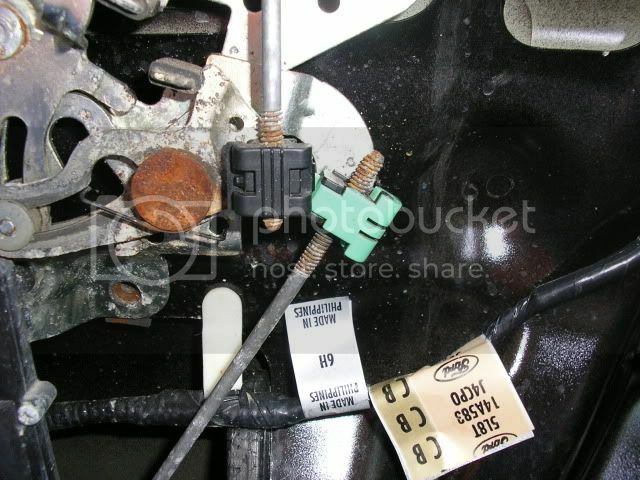 The another possibility is plastic clips couls have broken on the latch itself. dont try to remove the panel without getting either glass or the door opened or you can damage the trim panel. try pressing the unlock button and see if you hear a noise coming from the door panel. you should hear something. 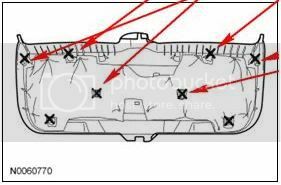 Recall 04V602000: Liftgate Latch Release Rod Replacement. I had this happen twice on my '01. Ended up taking it in to the dealer and had the module assembly (whatever that is) replaced first, and just three weeks later had the handle/lock mechanism replaced. Not having a key hole on the outside or a way to open the rear hatch from inside the vehicle .This is no good design for any vehicle. I had the same problem with my '02 Escape. Get in the back and pull the interior panel off from the top. It is held on by insert clips. After that, your problem (or mine was) the actuator that lacks the glass and door. Just move the actuator rod up to allow thw latch to work. My actuator is bad so I left it up to use the hatch and glass, but I can't lock it until I replace the actuator. I had the same problem with my 2001 Ford Escape and had pretty much accepted it even though it was very aggrivating. Read through the thread here, and I got a crowbar and *gently* pulled out the plastic cover just from the top- it's still attached on the bottom- just enough so I could pull up on what I assumed was the lock (it has a white accordian plastic thing on it around a blackish metal peice. Pull up on it to unlock and push down on it to re-lock). Awesome!!!! i did take panel off rear door from inside and moved the arm up with the black rubber on it. there is also easy fix for this problem. I too have had this problem for quite some time. Here is how I solved the problem for Free. First, you will need to get in the back of the Escape. I did this by opening the glass and climbing in. Open the glass door if you can because it will make it will allow you to open and close the door from inside (later on). You're going to pry the plastic away from the top of the door until you can open it and remove the screws that hold it in place. Here is a diagram of the locations of the retaining clips. 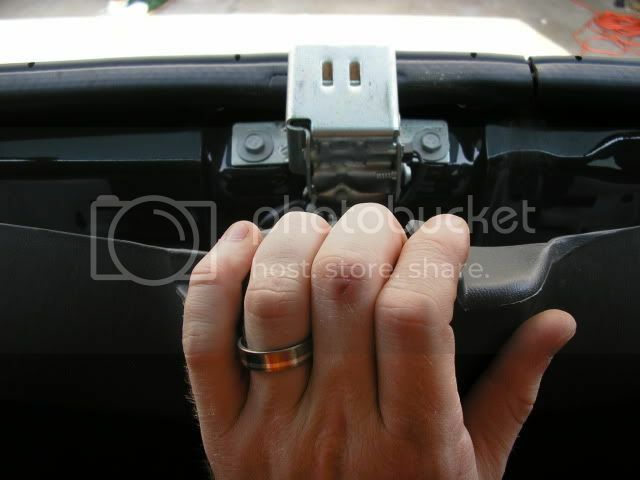 Once you have pulled each of the retaining clips loose from the door, your view should look like the picture below. Start at the bottom middle of the door and work your way up/right diagonally until you find the clip on the end of the threaded bar. In the pictures above and below, it is a sea green color. If you push down/left diagonally on this bar/clip, it will release the hatch and you can now open the door. I recommend removing the 4 screws in the bottom of the panel that weren't accessible until the door came open. One end of the threaded latch bar should now be loose. You will notice there is a little bit of play in the threaded bar that goes to the latch. Without pushing forcefully, push slightly down on the threaded bar and snap the sea green clip back on the threaded end (with less threads showing above the clip than were showing before). Now, test the door latch. You may have to play around with it a little until you get the door handle to work consistently. To put everything back together, just reverse the instructions above. 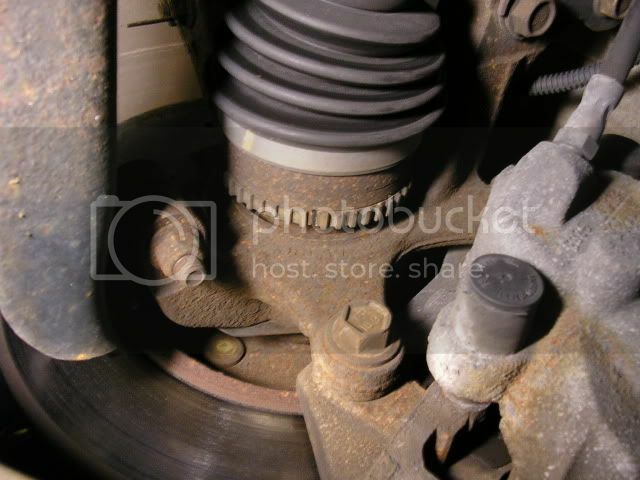 (Being careful to position retaining clips). Congratulations! You fixed your door free! I would also add that you can get a spray lubricant from Solder Seal, called "GUNK white lithium grease". All the places where you see metal to metal contact and the parts slide can be lubricated and the mechanism will work much more smoothly. It doesn't take much lubricant to make a significant difference. The little black cylinder in the middle bottom of the third picture is the motor that runs to operate the lock. It will run better and last longer if the mechanism is lubricated. 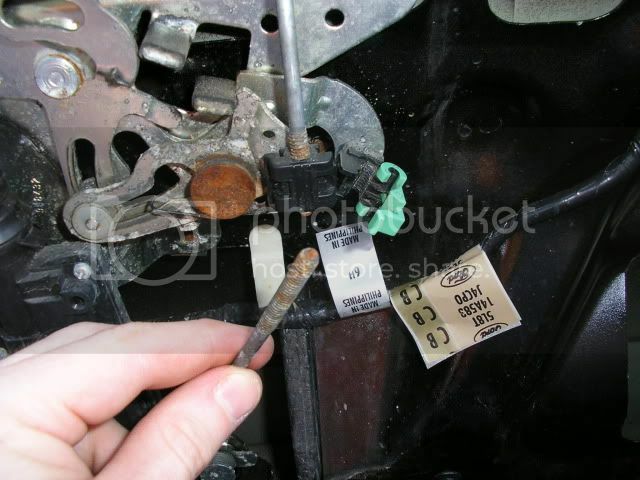 Labels: 2001 Escape rear passenger door will not open.